Periodontology is a specialization within dentistry that deals with the surrounding tooth tissues such as gums, jawbones and connective tissue. The supporting tissue can become inflamed due to various causes. In this case we speak of periodontitis. This doesn’t always cause complaints but in the long run the gums bleed, the jawbone is worn away and teeth can eventually come loose. It has been scientifically proven that periodontitis is a risk factor in the development of heart disease and premature birth in pregnancy. To treat periodontitis, the bacteria in the plaque must be removed, both above and below the gums. Perfect oral hygiene is of the utmost importance. Smoking and diabetes have a negative influence on the development and evolution of periodontitis. 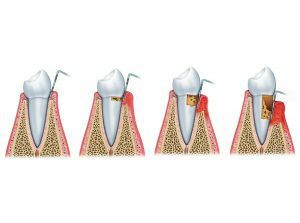 When periodontitis is already in an advanced stage, periodontal surgery or even tooth removal may be necessary. Our periodontist can treat periodontitis and ensure your mouth is healthy again and stays healthy so that you can keep your teeth as long as possible.